Today’s Travel Tip comes from my buddy Leslie Koch from New York. She is the founder and editor of Downtown Traveler, an online magazine for city dwellers who crave arts, culture and adventure. 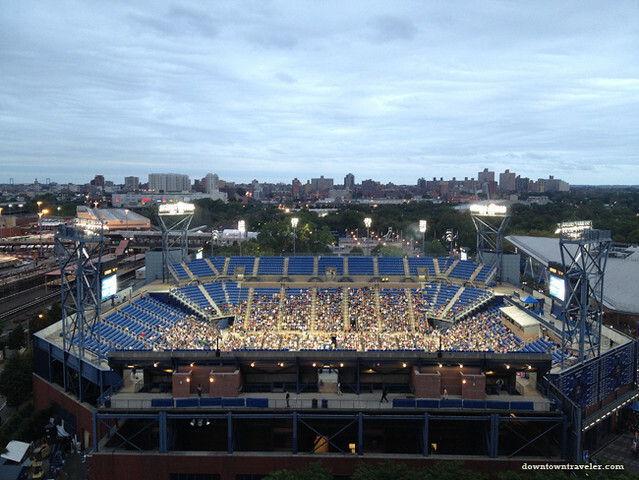 Like clockwork each year, the US Open tennis tournament draws international attention to Queens, one of New York City’s five boroughs. Since the first US Open in 1968, this Grand Slam tournament has attracted top-notch athletes, tennis fanatics and curiosity seekers. I fall into that latter category; I admit, I purchased tickets to this year’s US Open more out of curiosity than a love for the game. 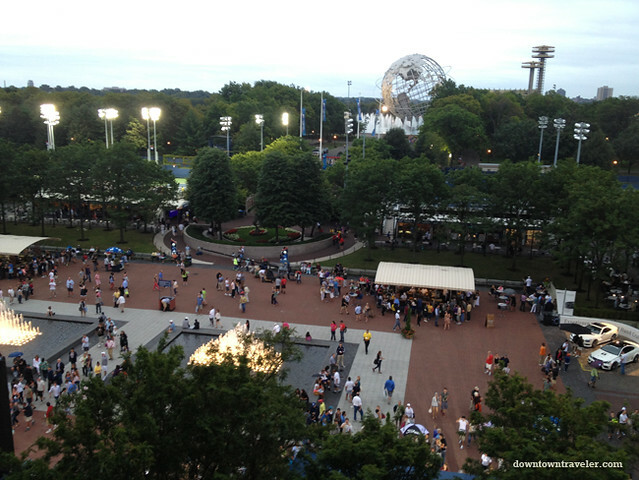 While I’m still figuring out a “set point” is, visiting Flushing Meadows Corona Park for the 2012 US Open was an exciting experience. On the cloudy Labor Day Monday that I visited, occasional bursts of rain and the threat of a full-on thunderstorm forced organizers to schedule the two primetime matches concurrently. This was actually a blessing, since the matches were over around 9:30PM instead of the wee morning hours. The US Open is held just across from Shea Stadium, home of the NY Mets baseball team, and the facilities share a subway stop. However, the US Open is a noticeably more upscale experience. 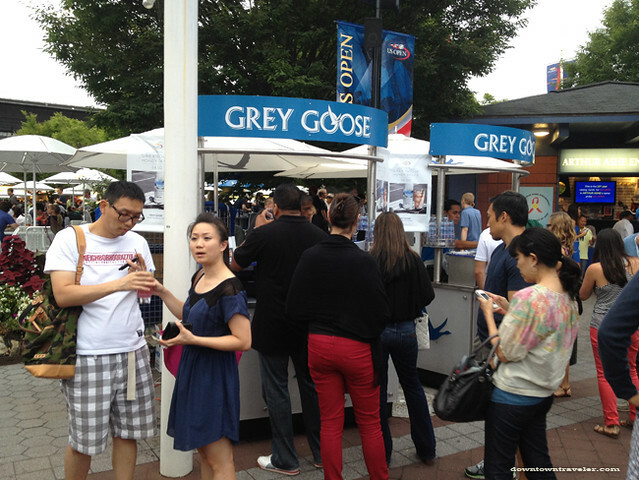 Instead of selling Budweiser beer, kiosks sell premium Grey Goose cocktails in plastic martini glasses, along with Evian water. Mercedes-Benz, the “official vehicle” of the Open, has several displays and even a show room at the US Open compound, and the American Express logo is emblazoned on every sign and activity. While watching a match, we used our binoculars to do a bit of celebrity spotting and noticed rapper Common sitting with the mother of the Williams sisters in the stands. The crowd was heavy on Polo-clad men and women in elegant summer dresses. 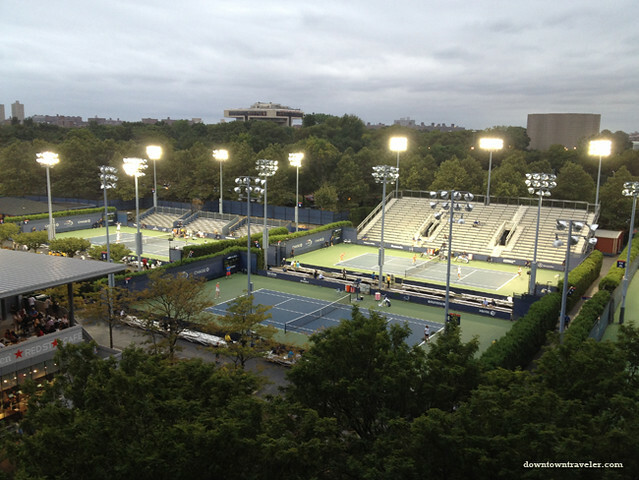 British star Andy Murray was the main draw in Arthur Ashe Stadium, named for the first male US Open winner, while American favorites Serena and Venus Williams played doubles in an outer court. I caught the Williams sisters play first, and enjoyed great seats in the smaller stadium. (Unfortunately, they lost). When the women’s doubles match was over, I joined the mass exodus to the men’s match. Andy Murray crushed his opponent, so I ducked out early and raced to the number 7 subway train before the crowds hit. Tickets to the US open aren’t cheap– we paid $60 a piece for upper level seats for the primetime matches– but the tournament has an exciting energy you won’t want to miss. If you’re on a budget, tickets to the earlier Qualifying Tournament are free! We’ll check out that option next year. 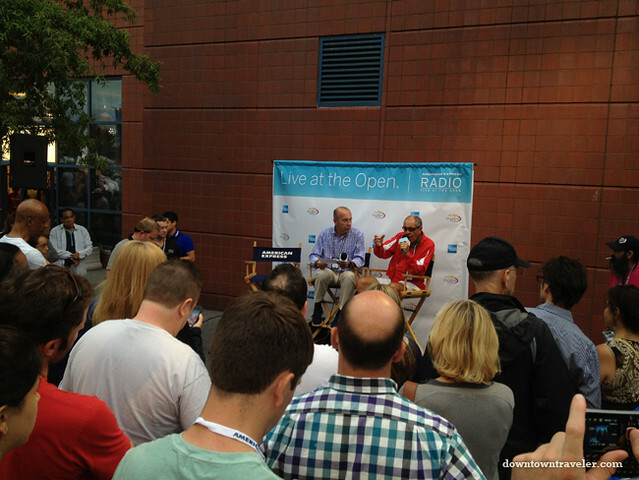 For more information on tickets and scheduling, visit the official US Open website. Leslie Koch is the founder and editor of Downtown Traveler, an online magazine for city dwellers who crave arts, culture and adventure. 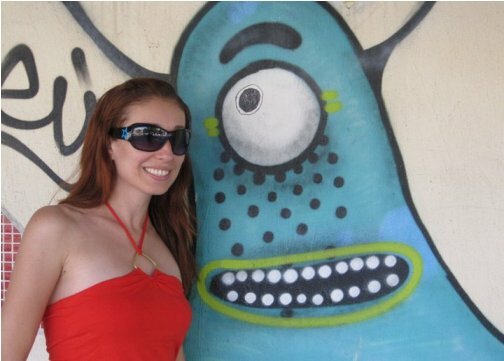 She left a corporate marketing career to backpack around the world for a year, visiting 17 countries on 5 continents. Now back in New York City, she enjoys exploring cultural attractions in the United States and around the world. Her favorite destinations include Wyoming and Brazil (both exotic for a New Yorker). Follow her on Twitter at @LeslieTravel. Thanks for featuring me! 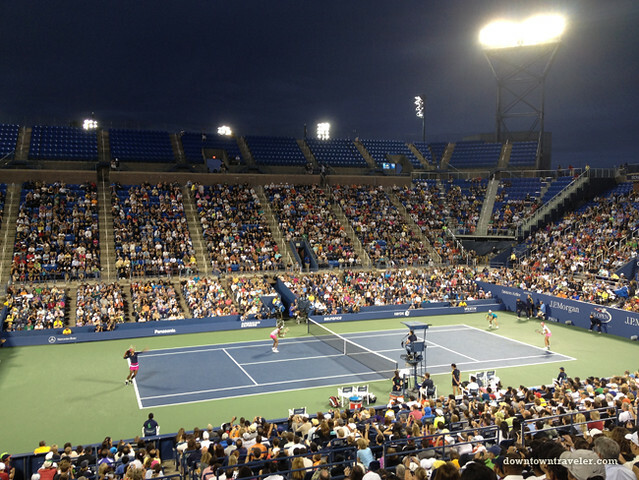 The US Open was fun– I’ll definitely be back next year (although I will hit up the free seats). Incredible the amount of people in the stadium. haha. nice!